"This is a green salsa I learned while in Mexico. 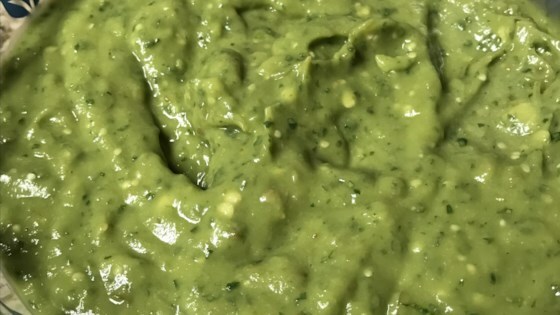 It is a green salsa with avocado and it is delicious! I always make it when we do carne asada. I am always begged for the recipe. Enjoy!" Bring a pot of water to a boil and stir in tomatillos and jalapenos. Boil until tomatillos turn bright green and soft, about 10 minutes. Place cilantro, avocados, cooked tomatillos, and cooked jalapenos into a blender, working in batches if necessary. Blend until smooth, 1 to 2 minutes. Add about 1 tablespoon of tomatillo cooking water, or as needed, if salsa is too thick. Stop the blender, and season the salsa with garlic powder and salt to taste. Blend again briefly to mix in the seasonings. Transfer to a bowl for serving. Serve either warm or cold the next day. Add the avocado pits to the finished salsa to keep it from browning in refrigerator. Very nice and oh so easy. Thanks I didn't change a thing. I changed it a little,, added two slices of red onion diced small and two TBLSP. Lime Juice. I don't like avocados but this is very good. Fresh and delish! My picky crew eats in on chips and tacos. I doubled all ingredients and flavored to our liking we absolutely loved it and got compliments on it. So easy although I agree that making it in batches makes for less of a mess.